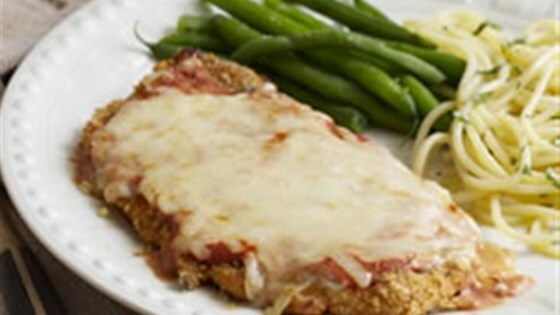 "Easy, baked chicken has a crisp crust, topped with a cream cheese-tomato sauce and Italiano Light Shredded Cheese. You'll have a delicious dinner in just 40 minutes." Mix coating mix and oregano in pie plate. Add 1 chicken breast; turn to evenly coat. Place in 13x9-inch pan sprayed with cooking spray. Repeat with remaining chicken breasts. Discard any remaining coating mixture. Spoon sauce over chicken; top with shredded cheese. Bake 10 minutes or until chicken is done (170 degrees F) and cheese is melted. Serve with hot cooked spaghetti and steamed green beans.